Australian nurses have been active participants in disaster assistance both within the in-hospital and out-of-hospital environment. 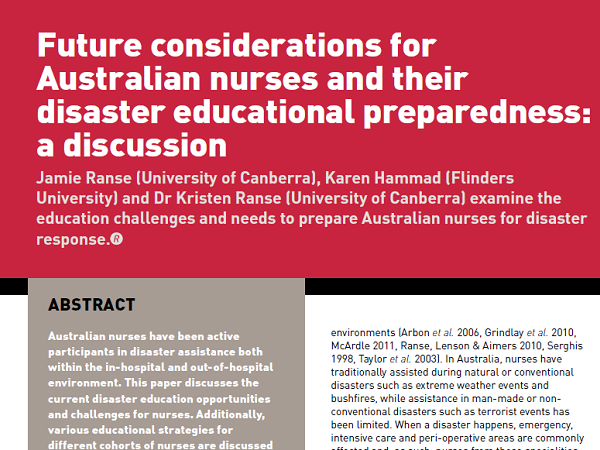 This paper discusses the current disaster education opportunities and challenges for nurses. Additionally, various educational strategies for different cohorts of nurses are discussed highlighting the need for education to be targeted at the right cohort of nurses, at the right time, using the right strategy. 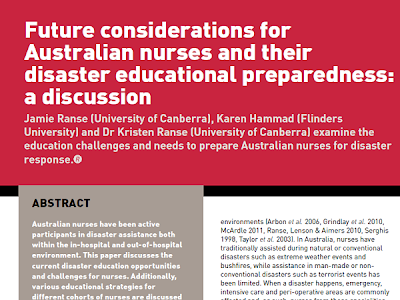 To enhance the educational preparedness of Australian nurses and subsequently their willingness to assist in a disaster it is suggested that the education should replicate the realities of ‘what it is like’ to assist in a disaster. Additionally, education should be positioned within a national framework for disaster health education.